There are 3 kinds of risks: the risk that you’ll get screwed or sued; the risk that you’ll get in a fight and the risk that you’ll lose the fight. These risks are ever present. The only way to avoid these risks completely is to stay on your couch. Even if you can’t avoid these risks, you can minimize their likelihood and impact by jumping up on the Risk Management Stool. 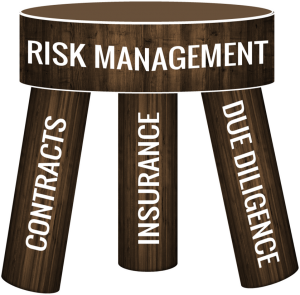 The Risk Management Stool sits on contracts, insurance and vigilant due diligence. Below are some tips. Keep your ego in check!